A Water Mouse forages in the supralittoral zone. A scientist studying an adult female Water Mouse in its habitat, south-east Queensland. Although the Water Mouse was once called the False Water Rat, there is not much that is rat-like about this animal. Its name, Xeromys, means 'dry' because it lacks adaptations for swimming. While it can swim, its hind feet do not have the webbing of true aquatic rats. 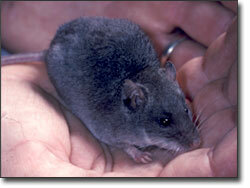 The Water Mouse is a small, dark grey mouse with white fur on its belly and spots on its back, and has small eyes. It lives in the mangroves and coastal wetlands of Queensland and the Northern Territory where it feeds on animals found in the mangroves at low tide. Semi-aquatic, it often sits in mangrove puddles, its water-repellent silky fur reducing the loss of body heat. 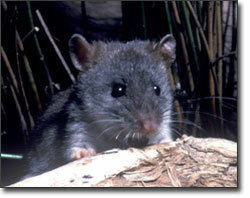 The Water Mouse lives in small scattered populations. It is nocturnal and is rarely seen, so no accurate count of numbers can be done. The animal's mangrove and coastal wetland habitat has been extensively cleared and redeveloped, particularly in south-east Queensland, and the Water Mouse is now classified as a species vulnerable to extinction. From 2000 to 2005, Queensland Museum scientists Dr Steve Van Dyck and Heather Janetzki studied some healthy Water Mouse populations living in mangroves near a canal estate development on the Gold Coast. Their mangrove habitat had been preserved, but by 2005 no Water Mice were being caught in live traps so the species was considered locally extinct. If there is a single cause of this extinction it is not yet known, but over time the scientists observed foxes, acid sulfate soils, spraying for mosquitoes, trampling of nests by cattle, and vehicles near the Water Mouse's habitat.